Note: I updated this blog post in 2019 for clarity and additional resources. In this post I want to talk about the F word: forgiveness. Forgiveness is a topic that’s prominent in all my books. It’s a core theme in spiritual practices, and it’s necessary if we want to live with freedom and grace. I want to give you a very simple tool that has helped me greatly when I need to forgive someone. If I’m in a heated place, no matter how angry or wounded I may feel, when I use this practice I can always come back to a place of oneness and forgiveness. Check out the video and then read on for more, including written instructions for this meditation. This forgiveness practice is simple: Sit in your meditation and call in the person who you resent or who you’re mad at. It might even be yourself in some cases. Think about all the things you love about them. Call on all the reasons you feel connected to them, all the ways in which they bring you joy, all the ways they support you. Call on the good that has come from this relationship. Start to cultivate the feeling of that goodness, love, acceptance and appreciation. As you do this you’ll feel a sense of relief wash over you. This is forgiveness. The feeling of relief, release and surrender means you are letting go. Remember that forgiveness is a process. When you need to forgive someone, I recommend being in this practice for 30 days. Use this simple meditation tool once a day for a month and let that presence of relief start to settle in. Let the relief move through you and clear you. In my free Judgment Detox Mini Course, I guide you through 3 core practices of my book Judgment Detox. Through these short video and audio lessons, you’ll begin the process of releasing judgment so you can feel better fast. 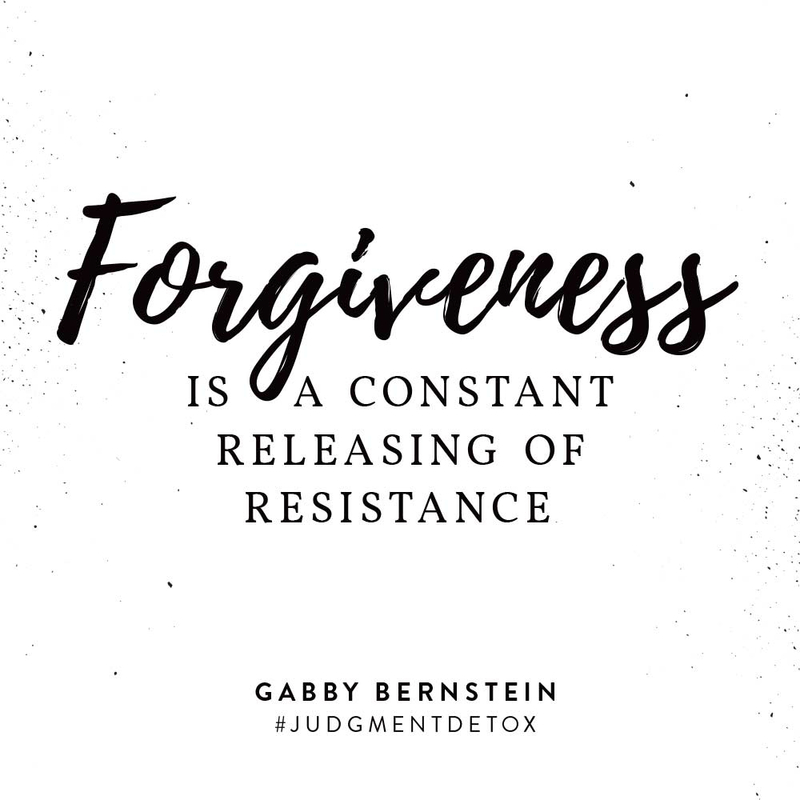 Forgiveness is a core component of my Judgment Detox method, and in step 6 I teach you how to practice radical forgiveness so you can be free! Start today with my free mini course. While this forgiveness practice is simple, forgiving someone can be hard. When you have a lot of hurt or anger, it can be difficult to surrender. But all it takes to forgive someone is your willingness. And you can start by focusing your practice on someone you might resent just a bit. That can be a lot easier to release. I want to hear your miracles! Jump into the comments and let me know how this forgiveness practice goes for you. It has supported me greatly, and I hope it supports you. Perfect… “The presence of release means you’re letting go.” I’m slowly starting to feel this feeling of release with my situation. I got here more from forgiving myself for allowing the abuse to paralyze me from love.. I’m going to do as you said about focusing on the lessons or the good that have come out if the abuse to see if I can come to a place of forgiveness with my perpetrator. ❤️ I love you G.
What if there is no love for the individual in question ? I can understand forgiveness !!! How would a Higher Power see this person? Can you be willing to see him/her as a Higher Power does? I was sexually abused from age 5-11. I’m in a relationship now with an amazing man for a year and a half. The problem is I’ve attacked him base on my insecurities, fear and jealousy. I just began recognizing and facing this about 4 months ago. I’m working really hard with therapy, anti depressants, prayer, exercise and thanks to my good friend, all your books! We recently broke up again because of one of my attacks. I think I’ve sabotaged this relationship and I’m devastated. I hope I get a chance to show up for myself and everyone in my life. I know this meditation will help, your books already have. I’m 51. Thanks Gabby, I’m obsessed with you! I’m so sorry this has happened and to hear of your breakup. Thank you for sharing this. You are a miracle worker. Keep up the work sister! How do you forgive yourself, when dealing with ongoing chronic illnesses over 7 + years. When you’ve lost everything you strove for over a lifetime. When family disappear and medical staff treat you as third class. When terror and insomnia resulting from trauma and illness persist. How can I find and promulgate mercy for me and those who have abused me. First off, I’m sorry this is happening. Second, it may seem too simple but I do think the tool I mention here can help. I encourage you to try and let me know how it goes for you. It’s interesting timing because I recently grew resentful of a relative over some harsh comments she recently made regarding immigrants. I was appalled and the resentment I felt for her truly took over the rest of my day, angered me all weekend and made me lose all respect for her during the process. I will definitely try this practice because the anger is sitting with me and I need to let it go. I am so happy I read this today. I am doing very well in my spiritual journey and have been very proud of myself. I have been desiring a relief in anger or annoyance, etc. regarding other people. I have always tended to my grievances and grudges with love and need to learn to release them. This was the perfect post to read today! Thank you! Because not practicing forgiveness is like imprisoning yourself – you miss out on events, parties, laughs, and the opportunity to make new memories…to not be alone and spend time with people. For years I stayed away…ignored the phone calls, the invites, the holidays – all because I was hurt and holding anger toward some family members. I couldn’t let it go and therefore I could not go, just because “so and so” was going to be there I missed out on so much. And for what? Since I have started reading “May Cause Miracles” there has been a huge shift a MEGA on how I now approach fear. I stop press pause and look at the fear, sit in it and go through the questions of why? and walk through it. I saw my cousins for the first time in 18 years yesterday for Easter. Anyone reading this, the forgiveness does not mean what they did to you was ok, but that you are ok and by releasing it – the forgiveness inside of you…you release and free yourself. Cydney I am so proud of you. May cause miracles also changed my life in a huge way. I have never felt more free. The rest of your life will now be an amazing journey. Kerry, I’m sorry this is happening. So beautiful and timely! I’ve been having trouble letting go of a recent romantic relationship and seeing it for what it really was – a lesson! Focusing on the good things it has brought me — a renewed sense of self, a reminder to practice self love first and the opportunity to find a partner better suited for me — will help me move on gratefully and not bitterly. Thank you, Gabby! Thank you for being the light too, sister! I have been doing this practice with the addition of prayer for the past 13 years. I ask God for help in forgiving the person and sometimes when I want to forgive but I am super resistant all I do is pray for the willingness to forgive until I feel it shift. Its been hugely helpful. My miracle with forgiveness occurred with a very challenging family member who was often cruel and just mean. I started with just praying on the willingness and it started to shift, then I prayed to be able to forgive her and brought in the meditation as well. My relationship with her got better and better. I was able to even feel love towards her and have fun talking to her. When she passed away a few years ago I felt very at peace knowing I had forgiven and we were in a good place. Gabby- thank you. The universe is sending a very clear message. This was not by accident that I saw your video today. I’m having the hardest time letting go of a relationship that I felt we both mutually ended. My heart hurts and there is a hollowness in my chest. The forgiveness I need to give is not only to the several relationships I’ve had in the past that affected the relationship I’m leaving now. My fear stood in the way. I became controlling and manipulative, always trying to create the outcome I wanted. I’m ashamed. However, I’m grateful for the experience because I would never have the chance to heal my wounds and move forward in love knowing I was still living in fear. Most importantly I need to forgive myself. I did my best with what I had and the universe felt it was time to heal those wounds and choose again. Which is exactly what I was asking for all along. Feeling positive is becoming more and more possible with the help of your guidance!!! Can’t wait to see you in New York for the Super Soul Sessions, June 1st!!!!!! Love you and thank you!! ( I count you as one of my earth angels) blessings! Love this Gabby. So helpful, as always. Thank you! Last year my best friend went away to an amazing school that travels around Europe. She had an amazing experience and we stayed in touch throughout her journey. However, when she came home for the summer, she learned she could not afford go back to this school the next year. I knew she was very upset about this and so I tried my best to comfort her and was the best friend i could be. She became very insecure and began to take her anger out on me. She was very passive aggressive and would manipulate our friend group to shut me out. Over time I realized I didn’t deserve to be treated this way and decided it was time to move on from this friendship. I have had a very hard time forgiving her for treating me this way. This video poped up at the perfect time because I am now ready to let go. Thank you for everything you do Gabby!! I am only 16 but you have helped me greatly. Thank you for sharing this. I’m so pleased this video served you. I saved this email to read at a later date. Today was the perfect time. I have been stuck. Mourning a relationship that I ended in November, watching them be in a new relationship less than 5 weeks later, struggling with acceptance because I really thought we would find our way back even though she is loving and living with someone else. We are in the same friend circle. I have been receiving messages about ego and pride and now forgiveness. I have known I had forgiveness to work on towards me and a few other key people. I am committed to using the forgiveness exercise you shared. Miracles are on their way to you, sister. I just want to say that you have helped me so much to forgive my past issues with my parents. Even though we still do not talk because they have chosen a different path, it is an amazing relief to be able to forgive them and let all of my past resentment go. The tools that I’ve found through your books have changed my life and I am so grateful to have found them. Nichole, you are a miracle worker. I was in such deep pain over my break up with my first husband of 14 years!!! The mental abuse, infertility, co-dependence, etc., etc. I used therapy as a healing tool but also used your suggestion of thinking of the good things that came out of our relationship. A move to Colorado that lead to a love my nature, the outdoors and an opportunity that landed me in a job in the travel business that took me all over the world for 30 years, just to name a few. The anger was released. After 35 years of not seeing him or speaking to him, I came face to face with my ex at my Mom’s memorial service. He took my hands in his and started to apologize profusely. I stopped him and told him there were many positive things that came out of our relationship and begin naming them. I felt no ill feelings whatsoever. When I returned home I received a text from my EX that read simply, Thank you, thank you , thank you. We were “both” free at last! I left a physical and emotionally abusive relationship with the father of my newborn child with the support of my family. It had been an ongoing battle with him and his mother for the last 5 years. He’s been very cruel to me and has no bond to my daughter. He’s only allowed supervised visits. How do I forgive him and open up to the law of attraction bringing her and I a life free of him. I know he would disappear but it seems he shows up in our lives only to emotionally and mentally hurt me. Gabby, there is a person who has only harmed me. I do not have love for him. I know I should forgive him but I don’t want to. No good came of the relationship. I still feel so much anger and resentment and pain, sometimes I don’t event want to WANT to forgive him even though I know I should. Even though I know it will be better for me to forgive him. I am still holding onto to the pain. I am still so angry at the pain he put me through. How do I move past this. I know it will be better for ME to forgive him but there is an evil part of me that wants him to suffer too and I feel like forgiving him isn’t fair. I know it isn’t rational but as much as I have tried to let go of this resentment, I can’t. Sarah, I’m so sorry this happened. Honor where you are. It’s OK to feel your feelings. You are aware that forgiving will be better, but you are also aware that you’re not ready. So be where you are without any expectations. I often ask my students that if you don’t have the willingness to forgive, do you have the willingness to be willing? That may be a place to start when you’re ready. My daughter has introduced me to your awesome work. I am going through a very difficult time with my husband. He lives with his friend since 2 months. We both are keeping an open mind about the outcome if we stay married or not by working on ourselves. I do have fear that it might not work out because I really love him and don’t want to loose my marriage. We went through a lot together. I am working with your book may cause miracles. It is very intense but very helpful to me. I am also practicing to forgive myself and my husband, but inside of me I am scared to let go. I have been a fan of your work for a long time, I have read all of your books and done a lot of work with myself. But this past year has been rough and I have been making mistakes that I regret. Some of my old mistakes have surfaced too. I have tried to forgive myself using your tools but it’s just not working out. How can I forgive myself? I feel like all these assingments keep repeating and I try to show up for them but it’s not working out. Thank you for being my light. Hi Gabby – first of all, you are an absolute angel and I love you and your work. I am grateful that my heart brought me here at a time when I’ve needed peace more than ever. Forgiveness is hard for me – especially forgiving myself. Long story short, I have just been told by my 3 year boyfriend whom I love dearly, that “his feelings have faded” and he started to become “unsure about the future.” Looking back, I can see that I was not my best self throughout the relationship due to personal turmoil and trauma I had been experiencing from a life event in 2014. He held on for 3 years, and I am saddened that he never communicated to me what was bothering him. I think my energy was just so high stress all the time, it tossed things out of “whack”…and not to mention, men don’t always communicate. Overall, I know in my heart he is the one for me. I pray to God all the time. I know what we had was beautiful and real, and I know the very thing that subconsciously drove him away (my anxiety)…I am trying to forgive myself for not being better when I had the chance to re-ignite things with him. These resources will help you. To really strengthen your trust in the Universe, read The Universe Has Your Back! Sending you love on this journey. I have recently left my marriage reason being that I was in a toxic relationship and very unhappy, I called apon the higher power to direct me and asked for signs and to heal me even before I live, it took me 8months to live and when I finally did, I was ready to and I was healed because I knew that I was guided, so since I’m back home living with my parents and my kids ,my vision is clear and I know that God is my source and his leading and guiding me , I have googled the universe has my back and your name showed up I’m happy and greatful that you have written this book. Beautiful. I’m happy you have asked for and received divine guidance. Love and light to you. Hi Gabby, this is exactly what I needed today! I have been battling with myself to forgive a family memeber who has been nothing but nasty towards me for years but All I want is peace for myself. And I think in order to do this I need to forgive her, however I still don’t want her in my life. Is it possible to forgive people and letting go without having to speak to them? on this wonderfull christmass eve I wanted to thank you from thd bottom of my heart to be such a magnificient precense on this earth. Your help guidance light and love is incredible and I really am thankfull for the I received through your book blog and dedication to your readers. Hope you enjoy the warmest most beautifull day tomorow and for this next year. I send in my positive thoughts for your book ( even do I am sure it will be a sucess) for it to reach new level of awareness in the world and that you be filled will joy and love to guide you this next year. Thanks for this it’s a helpful reminder when resentment was building. Simple but helpful. Thank you. Sat Nam from one Kundalini teacher and Life Coach to another. I have just come to learn that you actually CAN forgive those who are not asking for forgiveness. For whatever reason, this was (is) a difficult concept for me to understand. I have deeply forgiven in the past and have felt so much freedom and love towards the person I forgave…but she wanted and deserved my forgiveness. I am struggling with forgiving family members who are not asking for and probably don’t care if I do forgive them. But I want to. This is a major roadblock for me, so thank you…I will try this meditation. Namaste, Gabby! I LOVE this Forgiveness Process. I also study ACIM, LOA (via Esther Hicks), and other things. I love to use Higher Awareness to help me shift my emotions. I didn’t even know what it was! I had to look it up! It seems people don’t like me suggesting that we turn our emotions, hurts, wounds over to our higher power. It’s almost like they are telling me that it’s cheating (Bypassing) to want to go straight to God. I’m learning from all this that I can’t push my agenda into others. I get that sometimes people just aren’t ready. Even if my intentions are good. But this chorus of ‘spiritual bypassing’ came at me through social media earlier this year when I wanted to help to difuse strong emotions. I don’t know if you have any thoughts about this (Spiritual Bypassing, specifically) If you do, I would love to hear them. I ended up raging even more and being distraught for days after bringing the person who hurt me into my Meditation space. I think this is better for begginers as a guided meditation with a professional by their side. It’s important to know that rage is a very healthy emotion. If you were feeling hopeless before you meditated and wound up in rage you’re actually moving up the emotional scale in a positive way. Rage is something for us to work with, bring to our personal growth practice and honor. Don’t be afraid of your rage. Allow it to reveal new levels of healing.